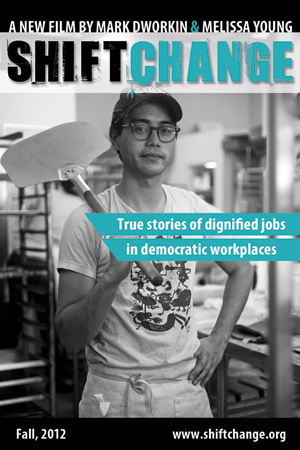 Melissa Young and Marc Dworkin are the producers of a new film, Shift Change, which examines worker owned and managed businesses in the U.S. and Mondragon, Spain. With the long d ecline in well-paid jobs, and today’s economic crisis, millions of workers in the U.S. and around the world are having a hard time making ends meet. Some are finding a solution in a different business model – to help re-invent our failing economy, restore long-term community stability and create a more egalitarian way of life. Businesses that are owned and managed by their workers tend to be more profitable, innovative and committed to the communities where they are based. Shift Change explores the more than 50 year old network of cooperative businesses in Mondragon, Spain, and a half-dozen thriving examples of the more than 300 worker cooperatives presently operating in the U.S. The film shares on-the-ground experience, lessons, and observations from the worker-owners on the front line of the new economy. Shift Change had its New England premier on October 21. It is distributed by Bullfrog Films. 2012 has been declared “The Year of the Coop” by the United Nations. You can subscribe to podcasts of our shows at our Feedburner site. This entry was posted in Programs and tagged cooperatives, documentary, economic justice, economy, Free School University, Mondragon, movies, occupy boston radio, solidarity economy, worker ownership. Bookmark the permalink. 1 Response to Wed 11/14 Shift Change: Worker Cooperatives in Mondragon and the U.S.